Town of Rogoznica is charming and picturesque tourist village in the center of Dalmatia with a beautiful coastline that is nearly 54 kilometers long. This quiet Mediterranean village is placed on the peninsula and because of its bay protected from strong winds, it is considered to be one of the safest Adriatic harbors specialized for all kinds of ships and boats. What once was a fishing town, over the years gradually shifted to be popular tourist destination. Today, this lovely town is a mixture between modern touristic elements and traditional life of fisherman. One part of the island is covered with pinewood, and the other, populated one, consists of charming stone houses that give the place that special Mediterranean atmosphere that will amaze you. For summer tourists, the most appealing part of the town are definitely beautiful little stone, pebble and concrete beaches where everybody can relax and find something to enjoy during hot summer days under Mediterraean sun. There are popular and crowded beaches as well as hidden private beaches for those who like to spend their holiday without stress and noise. Popular beaches in this area are Nart Beach, rocky beach that is not suitable for families and beach Miline, pebble beach in the center of town, ideal for families with small children. The most popular of them all is Sepurina beach, pebble Blue Flag beach ideal for all age groups. This beach is perfect for everyone, whether you just want to lie and relax or maybe you want to enjoy sailing, jet skiing or diving. Those who are more interested in town’s gastronomy will be pleased to know that this amazing little town has a rich offer of restaurants where you can try local specialities.and excellent wines. There is always plenty of freshly caught fish from local fishermen which complete this town’s culinary offer. The restaurants and cafes are situated in the one of the most beautiful marinas in Dalmatia – Marina Frapa, built on artificial island with a number of other facilities. Modern and elegant, this marina is open throughout the year and offers visitors high quality service, exceptional and friendly staff as well as unforgettable experience. Near Marina Frapa there is the site of the lake of Dragon’s eyes, filled with sea water. This nature phenomenon is considered to be natural bioreactor with biochemical processes taking place there. The lake is irregular in shape and surrounded with vertical cliffs and attracts many visitors like divers and scientists. Throughout the years, people in Rogoznica have passed the legend about two brothers who fought the dragon and even today there are older residents who will happily share this legend with you. If you don’t believe in legends and myths, you can always enjoy the beautiful sight or try to be adventurous and jump into the lake. 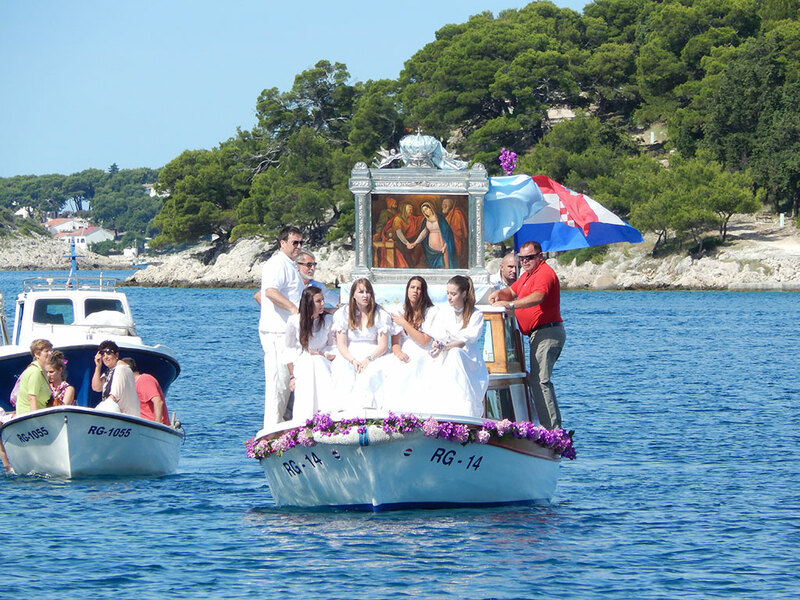 Culture and history lovers will be please to know that town of Rogoznica has something to offer in that area too. Upon your arrival, you should definitely visit Church of the Assumption, built in 1746 and the church of Saint Nicholas from the Middle Ages. The town of Rogoznica really is tourist paradise. It has large number of accommodation like family hotels, luxury villas or private apartments, as well as two luxury hotels placed in Marina Frapa. There is everything you need in one place and you can find supermarkets, pharmacy or post office without any problems. Also, during the summer, there are various events organized there, like the traditional Rogoznica fishing night. If you are seeking different kind of nightlife, you can always visit Croatia’s largest and the most famous discoteque club Aurora that is situated on the hills above nearby town Primošten. Rogoznica is peaceful and beautiful little fisherman town that offers you a short break from modern civilization. Charming stone houses, preserved natural beauties and clean Mediterranean sea… This town has everything. Once you get here, you will never want to leave. And why would you?